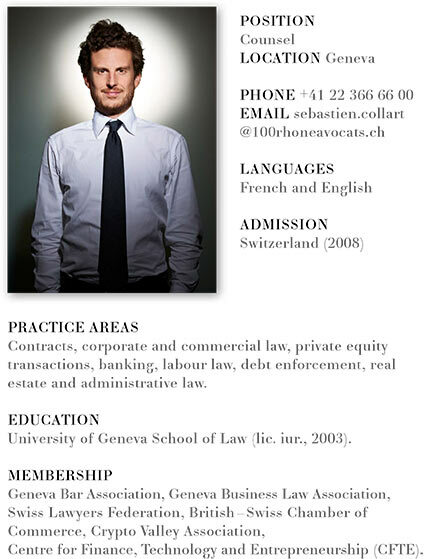 Sébastien Collart read law at the University of Geneva from which he graduated in 2003. He completed his legal traineeship with a Geneva-based law firm that specialised in civil litigation as well as in corporate and commercial law. He was admitted to the Bar in 2008. He then worked as a legal counsel for the Geneva government, mainly in the area of economic affairs. He joined 100 Rhône Avocats in November 2011 as an Associate and was appointed as Counsel in 2018. Sébastien Collart also qualified as a Solicitor (England & Wales) in 2018. Sébastien Collart has particular expertise in business law and corporate governance issues, real estate, with a specific interest for the law of contracts. He has extensive experience advising entrepreneurs and businesses of all sizes. He assists a variety of Swiss and international individuals and corporations on domestic and cross-border transactions, including private equity deals. Sébastien Collart has developed a keen interest in FinTech and in the regulatory aspects of cryptocurrencies and Initial Coin Offerings (or token generating events), with a particular focus on the implementation of Blockchain technology and Smart Contracts in various fields of law and business. Sébastien Collart is a member of the Crypto Valley Association in Zug, the British-Swiss Chamber of Commerce and the Centre for Finance, Technology and Entrepreneurship (CFTE). He also sits on the Board of a Swiss non-profit organization active in scientific, humanitarian and educational projects. As a Swiss and English dual national, he works in French and in English.